We have all been stressed. Things at school build up (report cards, conferences, SGOs, IEPs); we become ill with the common cold or something more serious (or even worse our children get sick); we meet with people that put us on edge (something that happened recently). In life we find ourselves in situations outside of our control. Over the past two years I have found that meditating helps ground me and bring me back to center when times get tough and my stress levels, heart rate, and blood pressure rise. I am not going to mislead you and have you thinking that I am some zen guru or a mindfulness master, but I can definitely tell you that I am a better, more focused person on the days that I practice meditation. Meditation is just that, a practice. I practice my breathing, paying attention to the breath as it enters my body and as it exits. I practice silence, refraining from using my words and listening more. I practice stillness, keeping my body in a seated pretzel position. I practice letting go of thoughts, freeing my mind from the never ending swirl of conversation. And I practice daily. My longest streak was for 100 days, some days including 2-3 sessions. Currently I am in the midst of a 40+ day streak that started at the tail end of January. That last practice, freeing my mind of thought is the hardest for me. I am CONSTANTLY thinking. My ideas swirl about in a crazy whirlwind that could benefit from Dumbledore's pensieve. During the school week I meditate in the morning, just after my daily twitter chat (#BFC530). I find that the calming start of to my day helps put me in the right mindset for the day I want to have. Inevitably thoughts creep in, whether it's my list for the day, things that have been bothering me, or something else, very rarely do I make it through my 10 minute guided meditation without an errant thought traveling through my mind. But the app that I use brings me back and refocuses my energy on my breath, or my posture, reminding me that losing focus and letting in thoughts is normal, and to accept it and move forward, back into the meditation. 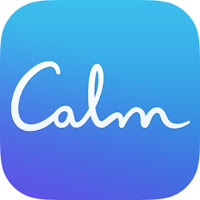 Calm-this app is my favorite. I discovered it last school year and liked it so much that last February I paid for a subscription that unlocked a plethora of guided meditations. Shortly after paying for for it, I discovered that teachers can get a free account to use in schools. Some of my favorite features include the Daily Calm-a new guided meditation each day, the customizable breathing exercises to help you relax quickly, the sounds and scenes, and the stats. Moving forward I think I might explore some of the sleep stories, as I have difficulty quieting my mind at night as well as in the morning. With so many features, I highly recommend this app! 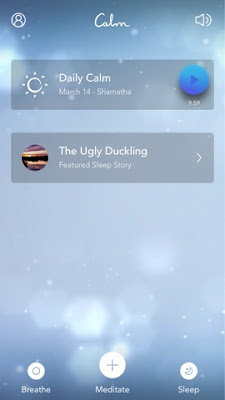 Insight Time-if you enjoy guided meditations and variety, this may be the perfect app for you. It's simple interface allows you to explore a top 20 list, playlists for kids, mindfulness, stress, and gratitude, as well as other features. Headspace-this app was used in a group meditation at school. I don't know much about the app personally, but I like the simple layout of the app and the ability to track your progress. Spiritual Me-an app that I have downloaded, yet never explored. If you use it, let me know how you like it. Mediation Studio-another app that I have downloaded and never used. Looking at the listed features, it seems similar to Calm, Insight Timer, and Headspace. Do you meditate? 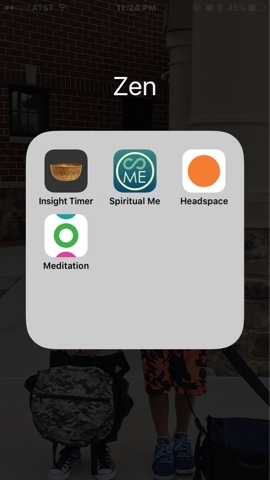 Do you have a favorite app to help guide you in your meditations? Do you meditate without assistance?